I have always done some sort of sport, ok a lot more when I was younger and more consistently. Over the years I had noticed how much harder it was becoming to stay motivated and carry on with any sport until the lets watch a movie together had won. Then the obvious pounds went on and the circle of too tired, no energy, let's just stay in, too cold to go for a walk/bike ride, it's raining had started. By Christmas 2011 I had become quite ill through ulcerative colitis an inflammatory bowel disease. With the medication I was on the nick - name moon face came out. I knew I needed to do something, but what? I was still on medication, running was too hard, and going to the gym on my own was too nerve racking and my diet was all over the place. I had heard about Les Slinn- personnel trainer and Allstar running group through a friend of mine. The beginners running course which I wanted to do but by then too embarrassed to go was in January 2012, although I enquired about this I was just too embarrassed to go. The old saying "I'm too big to go to the gym need to lose some weight before I go!" came to mind I couldn't go anywhere. I would lose a couple of pounds but nothing more. So I thought I know I will sort something when I finish my medication, then it was let's get the holiday over with. By then July had been & gone. No holiday photos were taking of me; I wasn't going to have that. 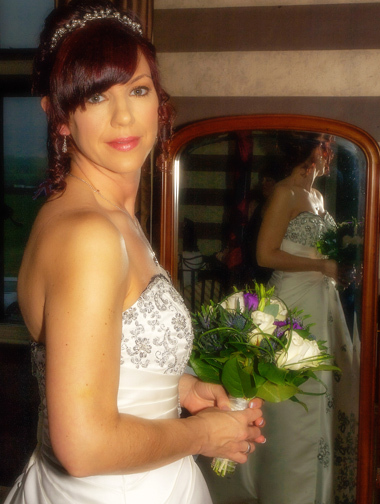 It was now nearly 6months to my wedding, I really did need some help. My son had recently had a bike accident which had affected his left leg had said about rebuilding his muscles in his leg and wanting to improve his fitness. I asked him if he would do something with me, not something a 16yr old would normally do. But not in a public gym. I still had Les Slinn's number so rang them made the appointment for both my son and I. Having met Clare, who went through some diet information, plan of actions what they can do what we would like to do etc. She then asked us to do a food diary and make appointment with Les. The truth was out there. We met Les who had our results from our food diary step 1: how bad? BAD! Then a small induction programme, how unfit; UNFIT! How embarrassed; next to none! I Couldn't believe it! Step 2, being weighed. That was embarrassing so I didn't look, Les was really supportive over this, it's a start not the end. As I had failed at nearly every diet going, and as soon as word diet was mentioned I would seem to eat more!! I was quite nervous of what Clare/Les had planned for me. Les & Clare's philosophy of we don't do diets but healthier options and healthier life choices was intriguing. Clare had given me a planner to follow for a few days, this was so much easier to follow then any diet and I was still eating â€œnormalâ€ food but in the right portions, healthier snacks, not seeds or milkshakes or pills. Clare and Les had both said we're here to help and show you different ways, healthier life changes. By August the 24th both my son & I were booked in for the following Fridays. I was nervous to say the least, teenage son (Kevin & Perry moments) and my lack of fitness. But every Friday when we walked through the door Les was there with a massive reassuring and encouraging smile. As the weeks went on we laughed about the way I would not look at the scales but just as Les's face. A smile every time! The weight was coming off ! Every session was tailored to both mine & Josh's needs and it was working. Not one week was the same. Biggest thing was how easy changing our lifestyle choices was. Every week was soo encouraging, like a big kid at Christmas !. I was beginning to notice the changes. I wanted to do more run for longer, faster (still not as fast as Josh) I could even do proper push ups, first time in my life! By October through Les's encouragement and reassurance I joined the Allstars running club, the friendliest people I have ever met, not your usual carrot & celery people but normal people just enjoying running/jogging. By November I was able to run a 7 mile race, 1st in a very long time and finished in 1hr 5mins. By Christmas 2012 I ran the Santa dash with my daughter and the Coate Water Santa dash, something I'd never done before. In February I ran the Longleat 10k in 57minutes, amazing! Josh's level of fitness improved along with his stamina which has reflected when he plays Ice Hockey. His attitude has changed and is more positive about his size and shape. We have a really good repore before & after our sessions which not alot of mum/sons have. He often refers to things that Les has said to him in training. By February 2013 my wedding; D day! I had lost 3 stone. I was no longer on any medication, no moon face, lots of energy, not tired all the time and have a special relationship with my son. LS personnel training is not just for people who have gained weight. But truly for everyone. Their philosophy about healthy life changes works well in everyday living. They're there for all ages, all size all fitness levels. Every time we go to Les for a session- the ongoing encouragement and support never stops good weeks and bad weeks Les is there with that massive smile of encouragement and support. I never thought that back in August when we first stepped though the LS training doors it would have this much of an impact or given me such a sense of achievement. Clare Davis - April 2013.